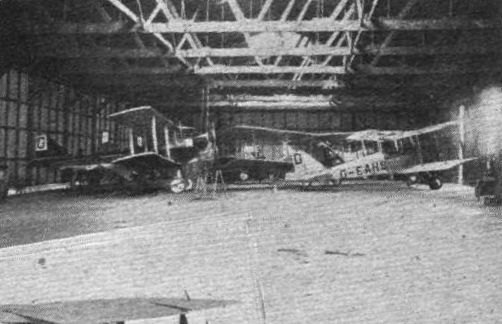 Central Aircraft Co. (STAND 67) Palmerston Works, Kilburn, and Northolt. THE "C.A.C." 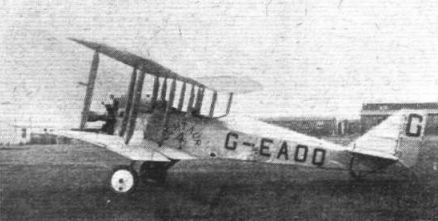 exhibit consists of the "Centaur 4B" 100 h.p. three-seater seaplane. This machine, like the "Centaur ДальшеMore>>> 4A" land 'bus, is a modification of the "Centaur 4," being an improved and slightly enlarged edition of this machine. 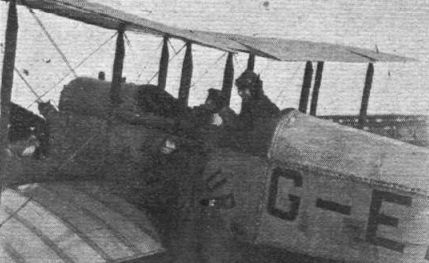 It is a small tractor seaplane of the twin-float type, fitted with a 100 h.p. Anzani engine. The floats have been the subject of considerable thought and experiment. Their co-ordination with the lifting power of the wings is excellent - they do not start to hydroplane before the latter are capable of supporting the weight of the machine, neither do they refuse to come "unstuck" when the right moment of taking off comes. Steering when on the surface of the water is effected by means of a small water rudder attached to the stem of the tail float. A C.A.C. 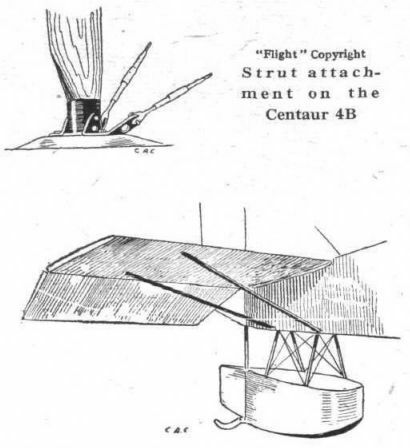 patent self-starting device for the engine, operated from the pilot's cockpit, is installed - an important feature in connection with seaplanes, obviating as it does the risky performance of swinging the prop whilst standing on the floats. In the design and construction of this machine, the outstanding characteristics are strength and simplicity, and from past experience of Mr. Fletcher's, the designer, work we feel confident that the new "Centaur" possesses these qualities in the most efficient form. The performance of this machine, both on the water and in the air, is, we understand, remarkable for a machine of its size. Its speed range is 40-75 m.p.h. with pilot and two passengers, and its climb, similarly loaded, to 1,000 ft. is but 2 mins. 40 secs. It can be looped and rolled with absolute safety - the factor of safety being nowhere less than eight. The initial price of the "Centaur 4B" is moderate, whilst it is also cheap to run and maintain - the fuel consumption being in the neighbourhood of 7 gals, of petrol, and one gal. of oil per hour. The floats are of ample size, in fact, one's first impression is that they are needlessly large. In practice, however, they have proved just about right, neither beginning to plane too soon, nor refusing to come "unstuck," when the machine has attained sufficient speed for the wings to lift. In shape, the floats are of a flat-bottomed type without any step. In front they are very shallow, and their greatest depth occurs at the rear. One is almost tempted to describe them as being old-fashioned, seeing that this shape of float was used extensively on some of the early Farman and other seaplanes. This is not, however, meant as a criticism of the floats. On the contrary, on lightly loaded machines like the "Centaur 4B" this form of float is probably as good as any for all-round efficiency. The tail is supported by a small tail float, V-bottomed, and there is a water rudder for steering the machine at low speeds. 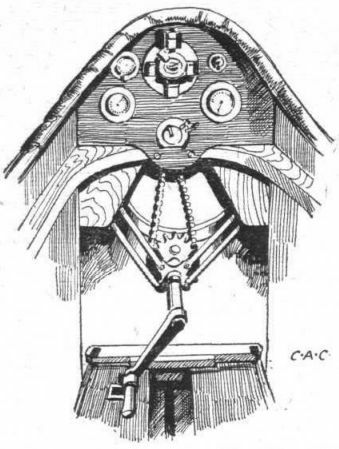 The fitting of this water rudder is the feature we like least in the design, since, as will be seen from our sketch, if the tail float itself is by the force of the sea, or from some other cause, pulled slightly out of its normal position, this would cause the rudder hinges to stick, and this might prevent the air rudder from operating. However this is a small point which can easily be remedied if in practice it should be found necessary to do so. The painting of the body is unusual, there being a series of horizontal black and green stripes, picked out in white. The effect of this is to make the body look longer and more slender than it really is, thus much improving the appearance of the machine. With regard to detail construction, there is little to be said about the machine. Everything is simple and straightforward, designed for quick and cheap production.